A recent article4 and accompanying commentary5 add another variable to the origin of limestone caves that will be of interest to creationists. It appears that sulfuric acid has been primarily responsible for the excavation of at least 10% of the caves in the Guadaloupe Mountains of southeastern New Mexico and west Texas. This is especially the case for the larger caves, such as Carlsbad Cavern and Lechuguilla Cave. This result is based on the discovery of the reaction products of sulfuric acid dissolution trapped in the cave. The sulfuric acid is formed by the oxidation of hydrogen sulfide in hydrothermal water. The reaction products include elemental sulfur, gypsum, hydrated halloysite, alunite, and other minerals. Alunite apparently can be dated by the 40Ar/39Ar dating technique, which provided the incentive for geologists to investigate the above reaction products. The 34S/32S ratio indicates the hydrogen sulfide is biogenic. What this means for creationists is that cave formation, in at least some cases, was much more rapid, since sulfuric acid is much stronger than carbonic acid. Sulfuric acid dissolution is not only postulated for the caves in the Guadaloupe Mountains, but it is thought that 10 % of known major caves worldwide were carved out by sulfuric acid.6,7 In the Guadaloupe Mountains, the reaction occurred below the water table (phreatic zone), which is currently much lower. Thus, cave formation is not necessarily a post-Flood phenomenon as Strahler thought. It could have formed anytime after the limestone was first deposited in the Flood, since hydrothermal water would be expected to begin moving through the limestone soon after deposition. Furthermore, once the cavern is formed, deposition of speleothems, mainly flowstone, can also occur below the water table, which contradicts the conventional wisdom.8 The biological signature of the sulfur isotopes would also fit into the Flood scenario of rapid deposition and decay of plants and animals upon burial. It is of further interest that the dating of alunite resulted in significantly older dates for Carlsbad Cavern and the other caves in the Guadaloupe Mountains. The new dates range from 4 to 12 million years (Ma) in the uniformitarian timescale. This does not give one much confidence in dating methods. Strahler, A.N., 1987. Science and Earth History—The Evolution/Creation Controversy, Prometheus Books, Buffalo, New York, p. 280. Return to text. Foster, R.J., 1969. General Geology, Charles E. Merrill Publishing Company, Columbus, Ohio, p. 268. Return to text. Plummer, C.C. and McGeary, D., 1996. Physical Geology, seventh edition, William C. Brown Publishers, Dubuque, Iowa, pp. 243–245. Return to text. Polyak, V.J., McIntosh, W.C., Güven, N. and Provencio, P., 1998. Age and origin of Carlsbad Cavern and related caves from 40Ar/39Ar of alunite. Science, 279:1919–1922. Return to text. Sasowsky, I.D., 1998. Determining the age of what is not there. Science, 279:1874. Return to text. Polyak et al., Ref. 4, p. 1921. Return to text. Palmer, A.N., 1991. Origin and morphology of limestone caves. 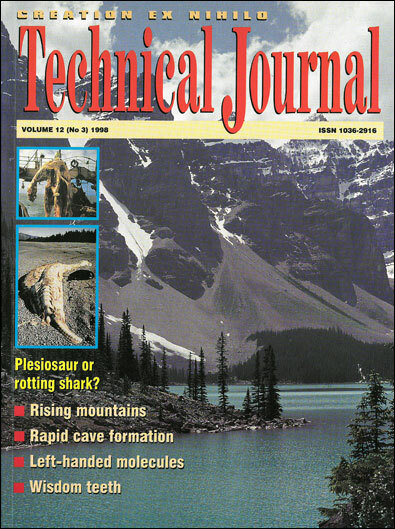 Geological Society of America Bulletin, 103:1–21. Return to text. Babic, L., Lackovic, D. and Horvatincic, N., 1996. Meteoric phreatic speleothems and the development of cave stratigraphy: an example from Tounj Cave, Dinarides, Croatia. Quaternary Science Reviews, 15:1013–1022. Return to text. Palmer, Ref. 7, p. 18. Return to text. Palmer, Ref. 7, p. 19. Return to text. Hill, C.A., 1990. Sulfuric acid speleogenesis of Carlsbad Cavern and its relationship to hydrocarbons, Delaware Basin, New Mexico and Texas. American Association of Petroleum Geologists Bulletin, 74:1685–1694. Return to text. Hill, Ref. 11, p. 1692. Return to text. Palmer, Ref. 7, p. 1. Return to text. Hill, Ref. 11, p. 1693. Return to text.